Obit. I lans Schmollcr-Haldy was Gruppenad/udant of I. for three months in Austria following the "Anschluss", to see if all was well there. I was later joined by the there was little military activity in Wien (Vienna) at that time. As the Gruppenadjudant, I had to prepare a daity list of put tlte names of four or five unmarried pilots with high skil fact, we all knew that German pilots were involved in Spain a to the Legion. Paradoxically, if somebody had said publicly til been immediately sent to a concentration camp. When the Legion Condor needed new pilots, my Kommandeur, max idci, wouki receive a cooeu telegram, Known oniy to me and my commander, from the RLM (German Aviation Ministry), which always read: ufG 135 meldet umgebend X Flugzeugführer für Sonderstab W" (IG 135 immediately reports X number of pilots to Sonderstab W"). I would then give Ibel the pilot's list, kept in a safe and he would chose those who would be sent. Of course, I had wanted to put my name amongst those at the top in the hope of going to Spain, but Ibel said he needed nie because the Grup/wnadjudant was his replacement when he was away, which occurred quite often. One Saturday evening at the end of November 1938,1 received orders to be in Berlin on Monday by late afternoon. Next day, a Sunday, my family (both parents, my brother and sister) had planned a midday meal. I did not say a word about my departure due to strict security restrictions.At the meal's end. I said goodbye to everyone, my father accompanied me to my car and asked, putting his hands on my shoulders:"What's the matter? Why-are you so silent?". I took Iiis hands away and quickly climbed into the car to hide my emotions. I just said: "Nothing, I'm just the same as I always am". I drove away.The only person I told was my closest friend,"Pips"Priller (later to become a well known acc) to whom I entrusted several of my personal belongings including my car and uniform. A few day's after my departure, my family received a telegram from the RLM explaining that I had been sent on a special mission and that they should not talk about my absence to anyone. Tliey were also given a private address in Berlin where they could write, however, no official service was ever mentioned. When I arrived in Berlin, I went to the given address where I spent the night. At about six o'clock the next morning I was driven in a plain car to Staaken where I met about 15 other men dressed in civilian clothes like me. Amongst them, I recognised several pilots who I had met previously at training schools or at the Richthofen Geschwader. 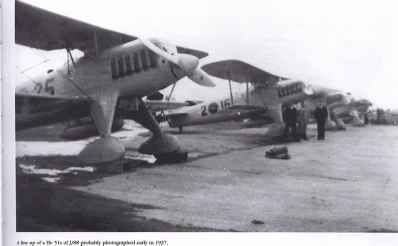 Shortly afterwards, wc were flown in a Ju 52 from Berlin to Italy.The aircraft was fitted with special auxiliary tanks to extend its endurance to at least eight hours and also carried a second crew. Perhaps because of the miserable weather, we landed first at Milan l>efore going on to Rome. Next day we transferred to Spain, landing at the La Cenia base where we were welcomed by a German in a Spanish uniform. I reported to my new Kommandeur, Major Grabmann who sent me to the third Staffel under Obit, von Bonin. I liked him immediately; lie was a good pilot and an excellent officer. His aristocratic origins were easy to guess. After a few days, von Bonin told me that I was to fly my first combat mission. This was during the last days of 1938. Our Technical Officer, Obit. Bolz, gave me the Bf 109 formerly piloted by Mölders which was probably to give me confidence. After take off wc quickly attained 4,000 m (13.000 ft) and headed for Barcelona. I think I was the first (there were six of as flying the mission) to sight a group of Ratas. I always had very good eyesight which probably saved my life many times during my long fighter career. I waggled my wings to warn my Rottenführer (Obit: Bolz). About six to seven minutes later they were on us. No aerial combat followed, just total confusion. For my part. I tried to avoid fighting, hoping that I wouldn't be shot down. I climbed at full power. It was probably the first time that Mölders' aircraft had performed such a manoeuvre. Was I a coward? No, I don't tliink so, I simply panicked. I just found myself alone in a dangerous situation, flying over a strange landscape in a foreign country. Fortunately, I had fairly good directional sense and did not need to recognise the landscape. I returned to where we liad started fighting, and my Intuition gave me the correct course home. With surprising certainty, I flew in the right direction. I soon found the church which I had sighted just after take off and considered a good landmark. I now knew thai within nine minutes I would lie over the base. Ill tile meantime, bad weather had moved in over the airfield, almost hiding the ground. In spite of the terrible conditions, I was the first to return and managed to land without difficulty before surprised eyes! In total, I flew 68 missions in Spain. I achieved no victories but was not shot down either. However, I did have to make one emergency landing due to an engine failure. I also took part in the big parades held in Spain during April and May 1939 and was amongst the last contingent, officers and men, to leave. Our Jagdgruppe was amongst the last to embark at Vigo for Hamburg. Our unit was a reinforced group - about 700 men instead of the normal strength of 500. Each Staffel had about 16 pilots instead the normal twelve in Germany. Shortly before we embarked for Germany we were asked:"Who would you like to see first on your arrival in Berlin?" I replied:"My father". Consequently, he was there when wc had our huge parade oil 6th June 1939. A day or so before this parade, we were instructed in the Döberitz area on how to get to the centre of Berlin. On the 6th, at about 05.00 hours, our contingent of about 5,000 soldiers were already in place for die march. South Berlin was sealed off so that no cars could enter. We were ordered to reach our departure position at a certain time with our unit at the head of the column. We started off in the direction of the Brandenburger Tor (Brandenburg Gate), and after about 1,500 metres, we arrived at a massive square where we took up our positions.Thc square was full of young boys and girls from the Hitler fugend, and thousands of cheering people. We began to march, parading past several stands full of NSDAP officials and eventually before Hitler in uniform. After the parade, wc received a message from the Führer. He wrote:"I am so proud of you all," and invited the Kommandeure and Staffelkapitäne to his Reichs Chancellery. As this did not conccrn me, I returned to the airfield, put on my civilian clothes and went home. I had received three weeks leave and was also pleased to see that my bank balance had swollen to over 7,000 Reichsmarks. With this time and money, 1 flew to North Africa. I finally returned to Germany shortly before the war began without any idea of how the political situation had developed. Not one of us would liavc imagined that a war in Western Europe was so close."